This is because the quote by Nicholas was religious and traditional. Voltaire’s was not religious in a traditional sense. 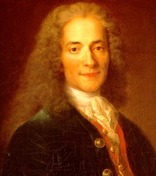 Voltaire- a guiding force in the French Enlightenment. This blog offers a novel interpretation of the above quote. An archaeologist digs for lost artifacts. A philosopher digs for lost knowledge. There is only one number square whose center is everywhere. You could say the center even usurps the circumference when the square is encased by concentric circles. This is as illustrated in the featured picture. Both the center and circumference of the of the 4 x 4 number square are filled by the essence of number 34. First, at the central point of any even number square are four numbers. This first even 4 x 4 square is the prime example. 7,10,11 and 6 occupy the center. Center’s sum = 34. Any straight row of 4 numbers also totals 34. This also applies to the four rows that make the perimeter. Hence each of the the four quadrants of the circle around this number square total 34. Thirty-four is one of the Fibonacci numbers. Center total: 7 + 10 + 6 + 11 = 34. 4 + 14 + 15 + 1 =34. Finally, 16 + 5 + 9 + 4 = 34. If God’s center is everywhere, that means it is also defines the circumference. The center is literally everywhere in this number square. Therefore, this number square becomes the numerical symbolic translation of the featured quote: God is an infinite circle whose center is everywhere and whose circumference is nowhere. The center by number 34 occupies the quadrants of the the circumference. Also see internal link below.